ESEEKGO (USPTO Register No. :5149872) is a registered trademark protected by US Trademark Law. ESEEKGO is specialized in producing all kinds of mobile phone parts manufacturer. We have a professional team and its own set of complete production lines and supply chain, from product design,development,manufacture,testing,sales,delivery and after-sales service. We promise 100% guarantee the quality and provide 30-day money back and one-year warranty and friendly easy-to-reach customer service for you. Please feel free to contact us if you have any question BEFORE you review it. We will try our best to solve your problem soon. 2.Size Option: Fitbit Charge 2 Replacement Bands fit for 6.7 inch-8.1 inch,please measure before purchase. 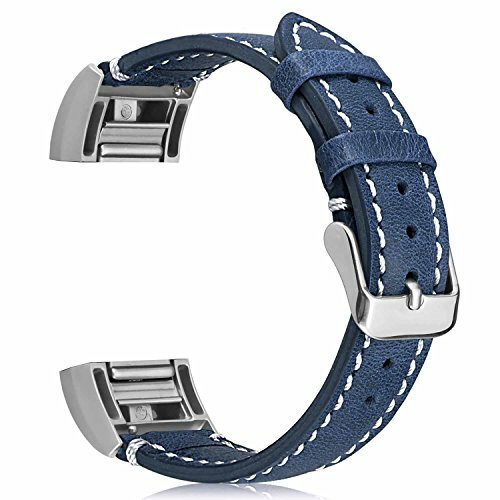 3.High Quality Material:Our Fitbit Charge 2 wristband is made of high quality cowhide genuine leather,no worry the color will rub off in few days. 4.Easy Installment :Easy installed the band with your smart watch, convenient to remove and change bands by hands. 1. On this page, click on "eseekgo" next to "Sold by", then click on "Ask a question"on the right top of page. 2. Log in your amazon account > choose "Your orders" > find the order ID > click "Contact seller". 1.Please do not wear this genuine leather band in sport,because sweat or water will damage the surface of the leather. 2.To ensure you can enjoy the best product and great after-sale service from ESEEKGO,Please avoid buying ESEEKGO products from Other Sellers, or We Can Not Promise the Product Quality ! FIT FOR FITBIT CHARGE 2 ONLY: ESEEKGO Replacment Bands fit well for your fitbit Charge 2 Smart Watch,very comfortable to wear it, and perfect to replace your original fitbit charge 2 wristband. EASY INSTAL BY YOURSELF: Easy installed the bands with your smart watch, convenient to remove and change bands by hands. ADJUSTABLE REPLACEMENT STRAP:This amazing Fitbit Charge 2 watch band can be adjusted to the wrist size (6.7"-8.1").Please measure before purchase. PACKAGE INCLUDE: Fitbit Charge 2 replacement band*1pcs ( no tracker ).ESEEKGO provide 30-day money back and one-year warranty and friendly easy-to-reach customer service for you.Please feel free to contact us if you have any question BEFORE you review it. We will try our best to solve your problem. If you have any questions about this product by ESeekGo, contact us by completing and submitting the form below. If you are looking for a specif part number, please include it with your message.